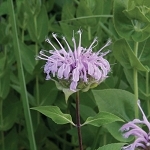 Lead plant's silvery-gray foliage and deep purple flower spikes add a striking contrast in prairie plantings and landscaped beds. It is a nutritious, palatable plant for livestock and wildlife, and young plants may need protection from deer and rabbits if they're abundant. 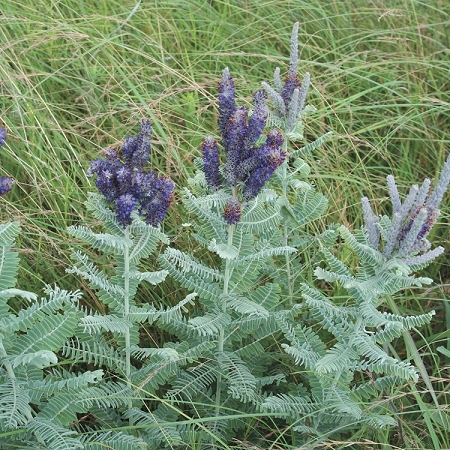 In the wild, lead plant is found on glades, prairies, and rocky open woods. Bees, butterflies, beetles and other insects visit lead plant--it is definitely a pollinator favorite. Lead plant can be used to make a yellowish colored tea. It has also been used medicinally in the past to treat a variety of ailments including intestinal worms, eczema, stomach pains, neuralgia, and rheumatism. Pustules on the plant contain a compound that can be used as an insecticide.